Alibaba has finally laid its hands on Indian market! Jack-Ma led company Alibaba through its marketplace AliExpress will list 100 million stock-keeping-units (SKUs) on Paytm. In February 2015, Alibaba had invested $575 million in Paytm to acquire 25% stakes in the company. During October 2014 Alibaba had pitched to Paytm to start a cross platform business in India. As per paytm sources the products will be listed by the end of May 2015. AliExpress has a lot of sellers and the tie-up will allow Chinese sellers to sell in India. They have more than 1 billion SKUs just for international markets. Paytm had launched an app for sellers in April 2015 for small and medium size business. It had opened up a Taobao style zero commission marketplace to tap in sellers. These products will be listed on the Seller App and the Chinese sellers will directly compete with Indian sellers. 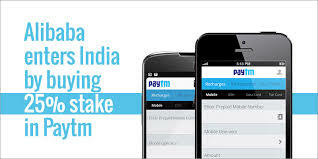 The Paytm mobile wallet will also be used by the Chinese company for the payments. Alipay is Alibaba’s mobile wallet which is not available in India due to regulatory limitations. “The items will be shipped within one week once we go live,” said Paytm officials. Paytm and AliExpress have tied-up with the official postal service of China called China Post which will deliver the products at the buyer’s doorstep.